Note: Truly Test Kitchen has ceased serving walk-in customers and is now delivery-only via Foodpanda, Deliveroo, Whattoeatsg or Ubereats. Hidden away on the upper floors of a nondescript building in the Tai Seng industrial estate is a kopitiam housing a quartet of food stalls that serve up fare that's as cheap as chips. There’s Truly Curry Rice, Handmade Meatball Porridge, Mian for noodle dishes, and Truly Western. 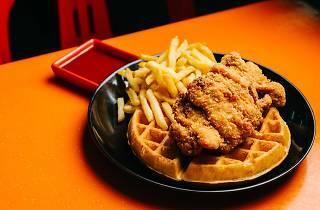 It’s at the lattermost where you’ll find Singapore’s cheapest fried chicken and waffles. 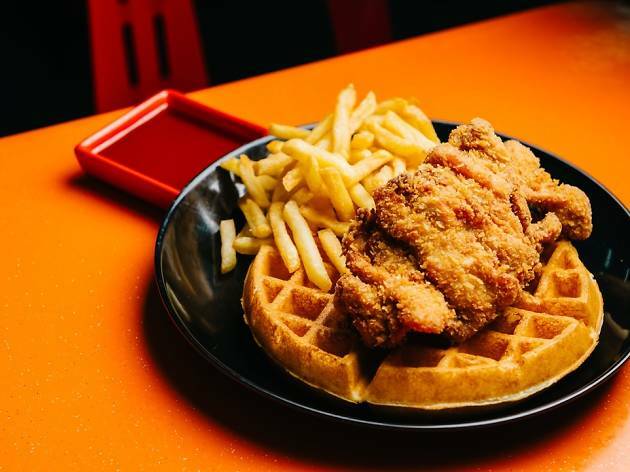 For just $4.50, you’re treated to a sweet and fluffy waffle, topped with crispy and tender chicken, and a heaping of French fries. Maple syrup is served on the side, but it’s too dull to add any dimension to the dish, so you’re better off eating the chicken and waffle on their own.